I don’t know if you guys have heard of sensory weighted blankets or not, but I am going to tell you about them. And let you know all the reasons why it is just a good thing to have for you or your kiddo. My youngest son has ADD and he is very gifted. This means that he has some sensory issues. He doesn’t like loud noises, he does not like hot food, and he does not like bright lights. Along with this, he has major problems getting to sleep, and staying asleep. He is always trying to stimulate his brain constantly, so it is very hard for him to turn it off. He especially loves to talk when he is supposed to be going to sleep. This is where the weighted blanket comes into play. I have known about these are a couple years, but just recently got one from someone I trust, for my son. How much the person weighs determines how much the blanket should weigh. So if your kiddo is little and younger their blanket weighs less, then as they grow, they will need a blanket with more weight in it. There are even weighted blankets for adults, they just have more weight in them. Then, the material of the blanket is usually soft and cozy. This was also something that we didn’t like about the first blanket we got. It was not soft. Also, the blanket needs to be not warm, even though the material is soft. These are all things that you need to take into account when getting a weighted blanket. Because all weighted blankets are not created equal. So now that you know what a weighted blanket is, I want to talk about why your kiddo needs one. 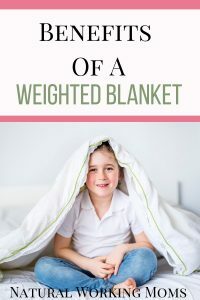 There is lots of research about them, and this research says that kiddos that have ADD, ADHD, Autism, or are just very sensitive to different stimuli benefit from a weighted blanket. It is like a calming touch. Or even a hug. Which is what these kiddos benefit from. It is also very helpful for making it easier for kids to sleep. My son has an awful time getting to sleep and staying asleep. Like I mentioned above, he is always trying to stimulate his brain, it is hard for him to relax and sleep. I have had patience with him and found something to help him. This weighted blanket has helped him a lot. To just relax him and help him sleep. 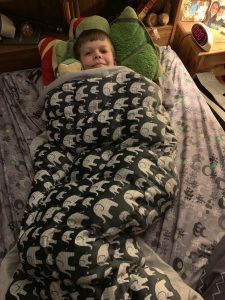 Now, I have talked about how this blanket helps kiddos that have ADD and Autism and such, but, you might be thinking, what about just my normal kiddo who just has problems getting to sleep? This sensory weighted blanket can help them also. It is a non-medicated way to help your kiddo go to sleep and stay asleep. Now, as I said above, when I decided to get my son a weighted blanket, I got one from a big company. And it was not great, it made too much noise and was not soft. Both my son and I were very disappointed! But then, I discovered a friend was starting her own small business making sensory weighted blankets! I was all over that for sure. We ended up being her first customer after she made one for her own daughter. The business we went with is called The Weighted Comfort, (this is not an affiliate link, I just think everyone should get their weighted blankets from her) and Nicole, who runs it, is amazing. Since her daughter has some sensory issues, she understood what I was talking about when I said it could not make noise and needed to be soft. And we discussed together how much weight my son needed in his blanket and what material we wanted to use (my son got elephants on his blanket!). Plus, she makes these blankets herself, very quickly! The blanket came really quickly! My son loves his blanket so much, that we are actually getting another one. We are getting one to put in the living room. So that when my son is watching tv or playing video games, he can snuggle in that. The first thing he does is grab a blanket to put on top of him. This is why I am thinking the weighted blanket in the living room will just really help him calm down after school and such. I also think it will be good for the rest of the family also. Because everyone needs some calming every once in awhile. If we can get it away from my son. So, this is why I love a sensory weighted blanket and why I specifically use The Weighted Comfort. If you are interested in getting your own weighted blanket for your kiddo or yourself (they come in adult sizes also), please just do your research so you get a good one. These are pricey blankets, and it seems like everyone is selling them now days. Even big box stores. But I have a feeling they did not do a lot of testing into what would be the correct weight. Or what would be the softest for kids with sensory issues. That is why you need to do your own research, and make sure you do not waste your money on something that doesn’t help. Cheaper is not always better when it comes to weighted blankets. If you aren’t interested in doing research just go with the small business that I used. Nicole has done all the research for you, and she knows what works. You will not regret it.